It can take years to process the data collected by a space probe. The Cassini space probe completed its mission in September 2017. It was then burnt in Saturn’s atmosphere. One of the missions of this spacecraft was the study of Titan, a Saturn’s moon. Titan is very particular in the solar system. It is the only celestial body with the Earth to have a liquid cycle on its surface. Titan has rains, lakes and seas, except that on Titan they are hydrocarbons, mainly methane and ethane. The Saturn‘s moon has a thick atmosphere but very low temperatures, making it one of the most fascinating places we know. 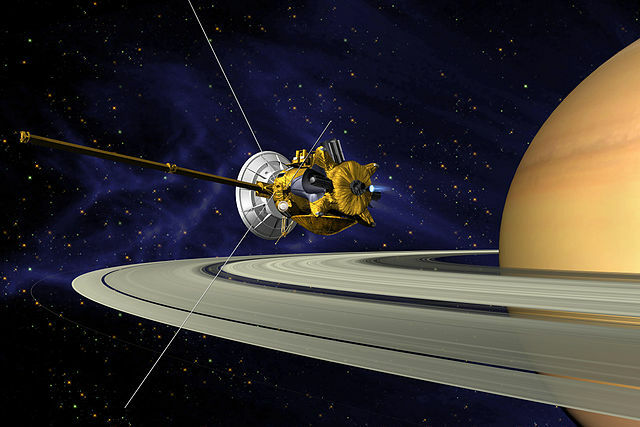 The Cassini space probe discovered several hydrocarbon lakes during its mission. But in June 2016, NASA’s space probe made an even more startling observation. On Titan, the northern hemisphere is richer in methane than the southern hemisphere. It would therefore be normal for there to be a larger liquid methane cycle, at least during summer. Cassini arrived near Titan in the middle of winter in the northern hemisphere and in the middle of summer in the southern hemisphere. In the southern hemisphere, the space probe observed hydrocarbon clouds and collected clues indicating that there had been rainfall. It observed morphologically transformed landscapes after the passage of large clouds. We were therefore looking forward to the arrival of summer in the northern hemisphere, which happened around 2016. But so far, we were rather disappointed. One study looked at photos taken in 2016 by Cassini. On some photos of the north pole of Saturn’s moon, we can observe clouds, and ephemeral tasks. They were not here in the photos taken a few weeks earlier and disappeared a few weeks later. The team that published the study thinks it is a reflection effect due to precipitation. If this discovery is confirmed, this would be the first evidence of hydrocarbon rains in the northern hemisphere of Titan. This gives even more interest to an already exciting region. The North Pole of Titan has hydrocarbon seas similar in size to the great American lakes. Perhaps this discovery will influence the choice of the next NASA New Frontiers mission. The US Space Agency will decide in a few months if it decides to send a drone on Titan or if it prefers to focus its efforts on a return of samples of the 67P comet. If the mission to Titan is selected, it will be an opportunity to explore deeply this Saturn’s moon. 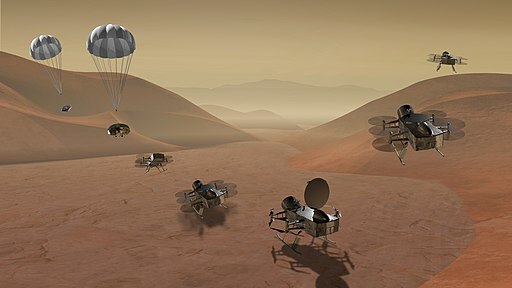 The drone, named Dragonfly, will be able to move during several terrestrial years on the surface and in the atmosphere of Titan thanks to nuclear energy. This would be an opportunity to study organic chemistry and to evaluate the habitability potential of the Saturn’s moon. We will know the final decision of NASA in July 2019. If the mission towards Titan is selected, it will be necessary to wait 2024 or 2025 for the launch, and some additional years for the travel.